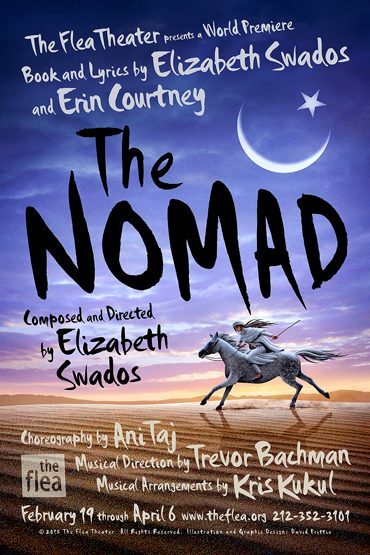 Elizabeth Swados has composed, written, and directed theater for over thirty years and is perhaps best known for her Broadway and international hit Runaways. Her short animated documentary My Depression: The Up and Down and Up of It will premiere on HBO in the spring of 2015 in tandem with the release of the paperback version of My Depression: A Picture Book. Aside from The Nomad, Ms. Swados’ newest musical Piano Bar will be featured at Joe’s Pub this spring and her horror opera based on the story of the Golem will open next fall at NYU’s Abe Burrows Theater. Swados has had over thirty works performed in New York as well as in festivals and tours around the world. She also does workshops with at risk teenagers and people who suffer from cranial facial disorders. She is a full time teacher in the drama department at New York University’s Tisch School of the Arts. Her articles have been published in the New York Times, New York Times Magazine, and Vogue. Her awards include five Tony nominations, three Obie Awards, a Guggenheim Fellowship, Ford Fellowship, Helen Hayes Award, Lila Acheson Wallace award, and a Special International PEN Citation. Her most recent awards include Best Book for Young Adults from New York Public Library and the Gaudium Award for enhancing the lives of others through art. Erin Courtney‘s play A Map of Virtue, produced by 13P and directed by Ken Rus Schmoll, was awarded an Obie and described as “one of the most terrifying plays of the past decade” by Alexis Soloski in the New York Times. Her newest play I Will Be Gone will be part of the 2015 Humana Festival at The Actors Theater of Louisville and will be directed by Kip Fagan. Ms. Courtney’s other plays include Honey Drop, Black Cat Lost, and Demon Baby. Her work has been produced and developed by the Theater Ninjas, Clubbed Thumb, The Flea, The Atlantic, New York Stage and Film, Adhesive Theater, Soho Rep, The Vineyard, and The Public. She has collaborated with Elizabeth Swados on the opera Kaspar Hauser. She has been awarded a Guggenheim Fellowship, was a resident at the MacDowell Colony, a recipient of a NYSCA grant and two MAP Fund grant from the Rockefeller Foundation. Demon Baby is published in two anthologies; New Downtown Now, edited by Mac Wellman and Young Jean Lee and published by University of Minnesota Press, and Funny, Strange, Provocative: Seven Plays by Clubbed Thumb edited by Maria Striar and Erin Detrick and published by Playscripts, Inc. A Map of Virtue and Black Cat Lost are published by 53rd State Press. She is an affiliated artist with Clubbed Thumb, a member of 13P, and a member of New Dramatists. She teaches in the MFAplaywriting program at Brooklyn College and is a co-founder of Brooklyn Writers Space. Mac Wellman’s MFA program at Brooklyn College, 2003. BA, Brown University, 1990.